I've mentioned before how color correcting has become a must for me nowadays when doing a full face of makeup. I definitely skip it on regular days when I have to go to work because really - aint' nobody got time for that. Nonetheless, I still make sure to keep a small stash of correctors on hand for days when I do have time for them. One of the newest additions to said stash, even if I've had it for over a year already, is the Catrice Cosmetics All Round Concealer Palette. My immediate thought when seeing this was that it would be perfect for traveling since you've got a (small) range of concealers and correctors all in one compact container. Plus, it had the two colors I used most when it comes to correcting - green for redness and orange for my dark circles. 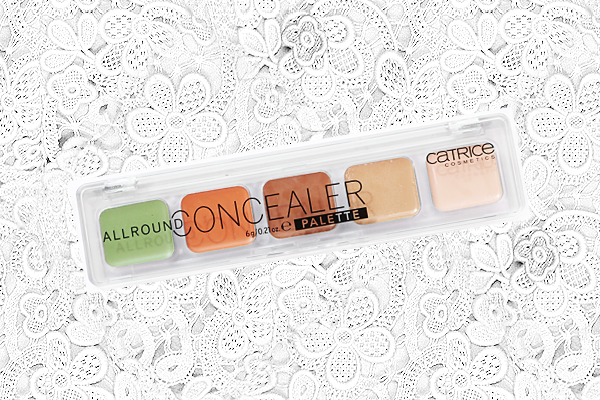 Catrice Cosmetics says, "A whole palette of options to always look great. With this set of five shades, it’s easy to even out small skin irregularities (beige shades), magic away dark shadows under your eyes (pink shades) and cover up redness (green shade). And application is super pleasant thanks to the creamy texture." Ethylhexyl Palmitate, Aluminium Starch Octenylsuccinate, Isostearyl Isostearate, Mica, Talc, Silica, Cerecin, Carnauba (Copernicia Cerifera) Wax, Caprylic/Capric Triglyceride, Phenyl Methicone, Tocopheryl Acetate, Aloe Barbadensis Leaf Extract, May Contain: CI 19140 (Yellow 5 Lake), CI 15850 (Red 7), CI 42090 (Blue 1), CI 77007 (Ultramarines), CI 77491, CI 77492, CI 77499 (Iron Oxides), CI 77510 (Ferric Ferrocyanide), CI 77891 (Titanium Dioxide). All five shades are pretty pigmented, which is always good when it comes to both correctors and concealers, and they leave a matte finish after applying. They don't look or feel anywhere near as creamy and 'dewy' as Catrice makes it appear on the product's page (link) which is a shame because I would have preferred that. All the shades set quickly too, which means you have to work just as quickly with it or it'll be a nightmare to blend out. I suggest using a damp sponge/beauty blender for that. Compared to your fingers or a brush, a damp sponge will at least keep the product as 'moist' as possible for longer while you're blending. Out of the five shades, I only consider three usable for myself. 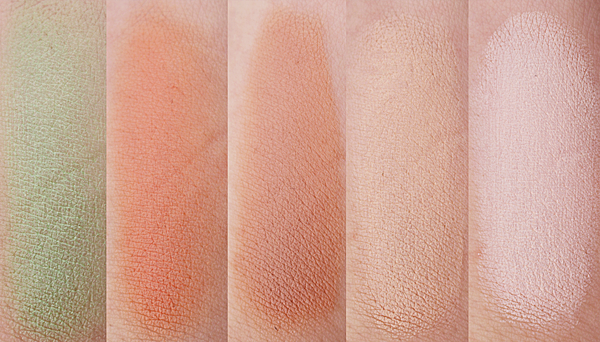 The middle shade is far too dark for me to use on any part of my face, even for contouring, and the one on the far right is both too light and too pink-toned for my yellow-toned complexion. Even if Catrice recommends using it to 'magic away' dark shadows under the eyes, all it does is give me the effect of reverse panda eyes. When it comes to my dark circles, I tend to want to neutralize the coloring under my eyes rather than brighten it. As for the other shades, though they do a fairly good job at minimizing redness (green), neutralizing dark shadows/circles (orange), and concealing blemishes (beige), the fast setting time just makes it a tad bit difficult to work with. Plus, despite their creamy consistency, they can easily emphasize any dry patches I have. I find that when it comes to correctors and concealers, for someone with my dry skin, liquid is best. Even if a liquid product can also emphasize dryness, blending is usually not a problem. Unfortunately, this palette isn't for me. I do love how travel-friendly it is, that fact doesn't change, but perhaps it's best suited for someone with skin that isn't as dry as mine and who doesn't mind needing to take a little bit more time and effort to blend. Perhaps Catrice can also consider strategically putting together shades based on general skin tone differences. For example, eliminating the middle shade for those with fairer complexions like mine, or replacing it with a lighter one, and eliminating the right most shade and replacing the beige one with a darker shade for those with warmer complexions. That way you'll be able to get more bang for your buck and use most, if not all, of the shades in the palette.